Asia For Jesus » Khmer Christian Bible: Hot off the press! It’s finally here! After 8 years of translation, editing layouts, creating beautiful fonts, testing, proofreading, and evaluating huge amounts of feedback we have finally launched the New Testament of the Khmer Christian Bible! The Khmer Christian Bible was a team effort with leaders from many different churches and denominations all working to translate a very accurate Bible from the Greek language. It has taken 8 years to complete the New Testament and the Old Testament is ongoing, with Genesis to be completed very soon. The goal of this translation is to be an essentially literal translation, yet using a vocabulary which is not too complex for the modern Khmer reader. We also desired a translation which is 100% Khmer in spelling, grammar and punctuation and have worked with some of Cambodia’s top linguists and scholars to produce a grammatically correct Bible. We have added additional tools which have previously never been available to Cambodian Christians. For the first time ever, we have included a several hundred word concordance of key Bible terms so that readers can easily search to specific topics and verses. A larger, more extensive will also be available separately soon as well. There are also notes to explain Biblical references. These notes are not interpretative, but simply notes which add to the understanding of the text. We have even added more than 100 illustrations which have all been carefully drawn to reflect things which would be unknown to most Cambodian readers like “wineskins” and “rams horns”. Additionally, we have printed the New Testament with the words of Jesus Christ in red ink just to make the Bible more attractive, but also to make it clear which words Jesus said himself. Another special feature, is that we have spent thousands of dollars to create special Khmer fonts which are extremely easy to read. Anyone from children to older adults with weak eyesight will find this font easy to read. We have made the text large enough for anyone to read in low-light as most of Cambodia do not have electric lighting. An audio Bible is already complete and will be available on CD or by download very soon. Some of the most talented and best sounding voice masters in Cambodia have spent weeks carefully recording every word in the New Testament. Specially written Khmer music was added to the background of the audio Bible making a beautiful recording. Digital Bibles are already available on several platforms. We are creating even more platforms and would be willing to work with anyone to develop more platforms for digital Bibles including online Bibles and Bible study software. All these digital Bibles will be free of charge. The first New Testaments available now are either hardback or paperback, with vinyl and leather editions coming shortly. Both current editions are only $3.00 each. Every Bible is printed legally here in Cambodia on special Bible paper from Spain on our own printing press. Our goal is to print 1 million Bibles in the next five years for the people of Cambodia. 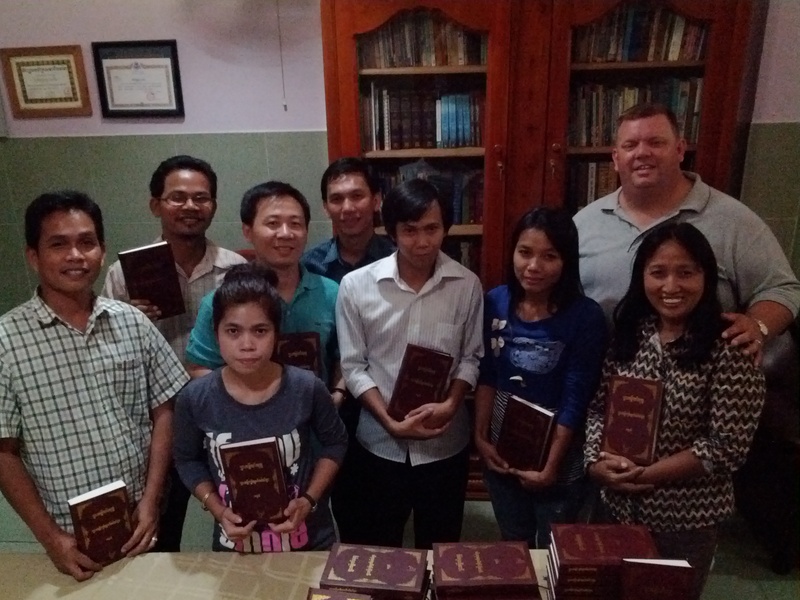 At present, a study of the church found that only 26% of Cambodian Christian own a Bible. We hope to change that statistic soon with the launching of this new Bible. Anyway, Mr. Steve. How can I (or other people) get the copies of these Bible? At Antioch Institute? You can contact Poline at 097-7997989 or come by Antioch Institute. Right now the demand is great, so we will get Bibles out as fast as we can. We hope to be producing 20,000 Bibles per month! I am sure you will love the Bible! Thanks so much! Thanks for letting me know, Mr. Steve. I’ll let my friends know as well. Praise God! Congratulations to you and your team. This is fantastic news and an accomplishment that will have a great impact for the kingdom in Cambodia and beyond. Praise the Lord, brother! That is so awesome! I shared this with Stephanie and we are really excited at what God is doing in Cambodia. Well done! Way to stay with it and get it done! Praise God! We look forward to seeing those first Bibles off the press. Great news! We will definitely be ordering some in the near future. Will they be available at the Bible Society? I don’t even know where the Bible Society is! 🙂 We are recruiting distributors right now! Dear Jim, well I have been working in literature in Cambodia since 1994. I worked with the Cambodian Bible Society and was on its board, but my passion is the rural church. Do you know where you can buy a Bible in Cambodia? One of 3 places in Phnom Penh. There are one or two missionaries in provinces who sell them on their own, but there is no national distribution. Bible League is the only one who had a national distribution plan. According to a nationwide survey 74% of all literate Christians do not have access to a Bible. That is the main reason behind the Khmer Christian Bible: ACCESSIBILITY to the Scriptures. We also assembled a team of Christian Khmer (living in Cambodia) scholars including consultants for grammar and spelling from the top linguistic scholars in the nation to make an ACCURATE, LITERAL and CLEAR translation of the scriptures. The multi-denominational Evangelical team of translators worked 8 years on the NT alone. The OT is being prepared right now. I don’t want to criticize the other 4 Bible Versions available in Cambodia, but we feel the Khmer Christian Bible is very accurate to the original languages because we did not translate it from English, but from Greek and Hebrew. We also wanted to develop Bible study tools and so we have a full concordance of the NT and a 100 page concordance is included with every NT. Cambodia has never had a concordance before. There are also hundreds of notes and illustrations. I wrote a 100 page document on why Cambodia needed a new version, but this is just a summary! I won’t bore you with the 100 pages! Hi Steve . . in this 28June12 blogpost above, you mention that you have digital versions of your NT available for download . . I haven’t been able to find a link for for them . . do you have it in a MS Word version? . . just realized you probably don’t have an MS Word version of your NT since you made special fonts for it . . do you have a version that I could possibly copy from and paste into an MS Word document? Thanks for your great work with your team! I tried to get Khmer Christian Bible and Audio CD from several christian book stores, but could not. Can you tell me where I can get them?